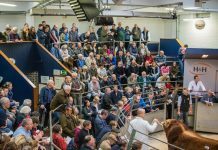 The 10th Anniversary of the Brecon Show Potentials Sale held with McCartneys on Saturday 9 February saw an eight month old Limousin cross heifer from locals Dai Brute and family, Gwndwnwal, Talyllyn, top the trade at a £6,700 when going under the hammer to J M & S M Rowlands, Dolwen Farm, Llanidloes. 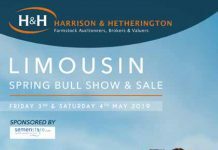 This fixture at Brecon is a well-known sale for beef bred calves with the potential of going on to show during the summer months and winter fatstock shows. 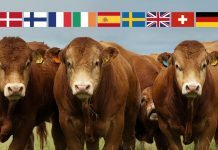 Cattle from this sale have regularly gone on to win major shows around the UK, so much so the sale attracts vendors and buyers from all over the UK. 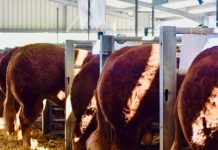 Limousin genetics once again dominated the show honours and led prices across the board, yet more evidence of the steadfast demand for the breed which is already characterizing 2018. This year’s Judge, winner of last year’s Royal Welsh Winter Fair, Mr Phil Price, Hay on Wye, had earlier in the day placed the smart heifer, by Cwmlimo Hercules out of a Limousin cross dam as his Overall Champion in the pre-sale show. 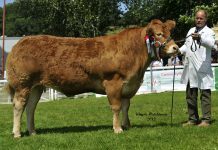 Having stood as Reserve Heifer to Dai’s winning beast, Reserve Overall Champion was the August 2017 born Little Mix, from R W and L A Jones, Lower Argoed Farm, Erwood, Builth Wells. This classy youngster is by Emslies Galileo and out of a British Blue dam. 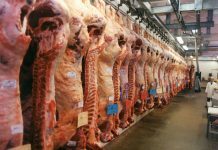 She was knocked down for £4,700 to S & A May, Sheltwood Farm, Bromsgrove. 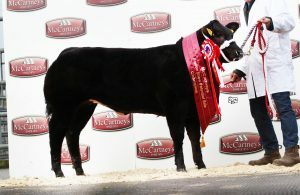 The Champion steer again featured Limousin genetics this time in the shape of Tyisaf Nailer from P J and T A Jones, Tyisaf, Erwood, Builth Wells. 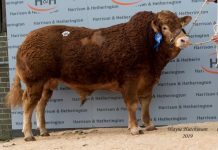 By the Ampertaine Elgin son Sheehills Jet and out of Richland Bubbles, Mike Rowlands also secured this smart lot with the hammer going down at £3,400. 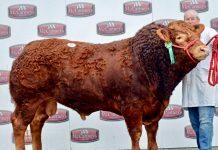 The Brute family had more success on the day, taking the Reserve Steer Championship with a May 2017 born Limousin cross. 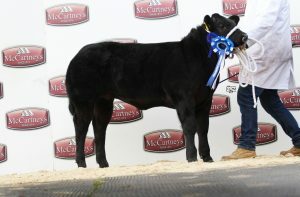 This stylish steer sold at £3,200 to C J Harris, Little Lambert, Torrington. 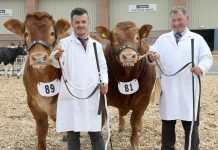 The family achieved another solid price for a Limousin cross heifer of the same age, making £3,400 when selling to M Wynne, Hall Farm House, Matlock.